Barks and wags tail with gusto. 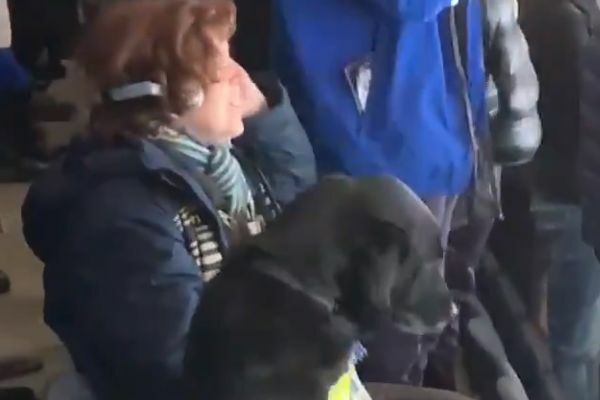 This Leeds United’s fan’s guide dog celebrated Jack Harrison’s winner against Sheffield Wednesday with gusto at Elland Road on Saturday. Harrison’s 65th minute goal tightened Marcelo Bielsa’s side’s grip on the second automatic promotion spot in the Championship. And the prospect of Premier League football for the first time since 2003 proved far too exciting for the canine assistant. A flurry of barking and tail-wagging ensued, ramping up the celebratory atmosphere amidst an already jubilant sea of home supporters. Leeds are three points behind top-of-the-table Norwich City, although Daniel Farke’s Canaries have a game in hand. Steve Bruce’s Sheffield Wednesday lie 10th, six points shy of Bristol City who occupy the final playoffs place.